The focus of the Language Arts program in grades DK-2 is on developing foundational skills in reading, writing, listening, and speaking. Students read and are read to daily, and receive guidance as they progress from working with individual sounds in words to continuous text in teacher-led book groups. The writing program encourages students to express their ideas and revise and edit writing with teacher guidance. The Language Arts program is designed to help students learn to read and write, in preparation for the work in Upper Elementary where they ultimately read and write to learn. Beginning in Kindergarten, we utilize the Sound Steps to Reading program for phonics instruction, developed by British cognitive psychologist Diane McGuiness. This program is designed to give students a strong foundation in understanding the relationship between sounds and letters in the English language. Beyond phonics, Kindergarten through 2nd grade classrooms utilize the Reading and Writing Workshops developed at Teachers College, Columbia University. The goal of these workshops is not simply to create students who read and write, but students who ARE readers and writers. During these workshops, students practice reading texts at their independent level, reading in teacher-guided book groups, write original pieces, and receive feedback and guidance from teachers towards producing a clear message. The skills listed below are a sampling of some of the main expectations we have for our DK-2 students in reading and writing. Assessments are ongoing, and students acquire skills and proficiency at different rates. 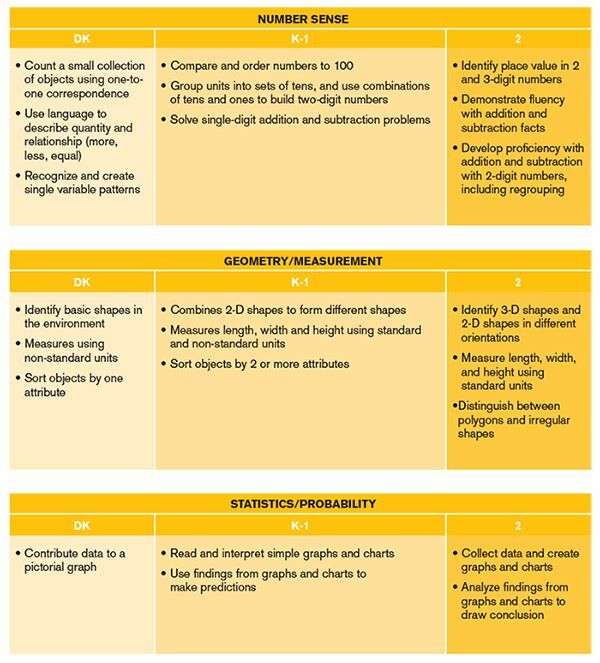 The focus of the mathematics program in the primary (DK-2) grades is on building a solid foundational understanding of number sense, geometry and measurement, and statistics and probability. Our math curriculum is primarily driven by the University of Chicago’s Everyday Mathematics program, which provides extensive, research-based activities differentiated for a variety of learning styles. Our teachers have also been trained in Cognitively Guided Instruction (CGI), an approach to teaching mathematics that encourages listening to children’s mathematical thinking and using it as a basis for instruction. Our math curriculum encourages young students to explore strategies for building conceptual understanding and solving problems, within a supportive community of teachers and peers. The skills listed below are a sampling of some of the main expectations we have for our DK-2 students in mathematics. Assessments are ongoing, and students acquire skills and proficiency at different rates. We believe our youngest students come to us with an innate mindset well-suited for scientific pursuits. DK-2 students are inquisitive, imaginative, and natural explorers of the world around them. Our goal with science instruction in the early grades is to support these innate qualities and give young learners the tools and structure to participate in the work of scientists. The Lower School science curriculum is based on the concepts and skills suggested by state and national standards and is incorporated into several interdisciplinary thematic units throughout the school year (listed below). Students use the scientific method as they formulate hypotheses, conduct experiments, and form conclusions based on evidence. Science at the Willows is a hands-on, lab-based experience designed to make concepts accessible, relevant and engaging. Teachers encourage children to ask questions, record observations, and draw their own conclusions. Hands-on units give students the opportunity to learn about the world around them and to begin to learn the language of science. Field Trips are integrated into the units of study. In the primary grades, our social studies curriculum builds off of the strong overall focus on community at the Willows. Our youngest students explore what it means to be a part of our school community, and learn about how this relates to being a citizen of larger communities like our city, our country, and our world. The Lower School social studies curriculum is based on the concepts and skills suggested by state and national standards, and, like science instruction, is incorporated into several interdisciplinary thematic units throughout the school year (listed below). Field Trips are integrated into units of study. In order to strengthen connections to the values of our local communities and engage students in the concepts of the curriculum on a deeper level, each grade level participates in a community service project in partnership with a local service organization. Inspired by the design thinking work from Stanford’s d.school as well as our ongoing work with maker and our makerspaces on campus, we believe our approach to interdisciplinary learning can best be summarized as STEAM2 – incorporating Science, Technology, Engineering, Art, Math and Maker into a myriad of projects and schoolwide efforts. to respond to a change in the environment as part of their Animal Adaptations Unit. our students build foundational skills. Our outstanding choral program includes five choirs spanning kindergarten through eighth grade. The Willows Primary Choir is open to students in kindergarten through 2nd grade. Performing with a choir allows our students to sing with a large group and share their work with an audience. While the Primary Choir experience focuses on developing the singing voice, it also extends students’ musicianship skills as they encounter a wide variety of musical styles and learn to sing with others. The choir performs a Winter Concert and Spring Concert each year. Our visual art classes aim to develop understanding and enjoyment of art and to encourage students to observe, record and wonder about the world around them. Art is a way to process thinking about our world. Students discover techniques and skills to express themselves visually. Projects often connect with other areas of the curriculum and we begin this year exploring the school-wide theme of “Story.” We aim to develop students’ visual literacy through on-going discussion about their own work and that of others. Visiting art galleries and museums incorporates first-hand study of artwork from different cultures and time periods. A wide range of media is explored including, painting, drawing, textiles, digital media, ceramics, sculpture, printmaking and photography. We place as much emphasis on the artistic and creative process as the final product. Whether working collaboratively or individually, our goal is to empower students to see, to feel, and to create. Drama is an art form through which students develop awareness and empathy, heighten their perception and cognition, learn to manipulate language and movement, and improve their ability to function comfortably in front of others. Designed to spark the imagination and recognize each child’s creative voice, Lower Elementary creative dramatics, presentation, and performance opportunities are integrated into classroom curriculum. Poetry is a playful, interactive experience for our youngest Willows students! For five weeks in the fall, students learn to connect feelings and memories with language and images. Word games ignite ideas and invite sharing; developmental movement primes the brain for learning. In DK and kindergarten, poetry is about making word pictures that capture the imagination. Students listen to poems and then create their own visual/verbal responses. Deb and Kristy develop a magical art project to accompany the students’ final poems. In 1st and 2nd grades, students really begin to see themselves as poets. Children use their senses to observe, imagine, remember, and compare one thing to another. They proudly share their work in class, and receive individual feedback when it comes time to focus on word choice and editing. Classroom teachers encourage students to read and write poetry after this unit is complete, and every child has one poem published in the school poetry anthology. grade-level performs on stage, and then students return to their specially decorated classrooms to read individual poems and celebrate their success! Students in the gardening program grow weed, harvest, and cook their way through each year, helping students see the full picture of seed to table. By tending and nurturing the garden, and taking a seed and helping it grow, a student can see what is possible for all of us. Throughout the year, students participate in activities that strengthen motor skills and foster team spirit. We emphasize the importance of personal health and encourage students to focus on lifetime activity skills. Our goal is for students to develop both skill and confidence–important tools that students need to remain physically active and healthy throughout their lives. In developmental kindergarten through second grade, the focus during P.E. classes is on learning about one’s body through various fun and non-competitive games. Students develop a range of loco-motor and non-loco-motor skills that help increase foot- and hand-eye coordination. Throughout the year, the curriculum is balanced between movement concepts (jumping, hopping, running, balancing) and manipulative skills. After skills are introduced, children practice and repeat the skills in isolation and later incorporate the skills into cooperative games. Sportsmanship and cooperation are constant themes in every class. Children in Developmental Kindergarten visit the library once each week for read-alouds and hands-on activities. Children begin to learn about the parts of the library and some basic library terms (author, illustrator), and the check-out system. Kindergarten students visit the library once each week for read-alouds and hands-on activities. Children begin to learn about the library’s organization systems and select books to check out for one week. They also begin to learn about the research process. First and second graders visit the library once each week for activities that build understanding of the library’s organization systems and information literacy. Students begin to learn about the research process, often with projects that connect to their classroom explorations such as the rainforest in first grade, oceans and eminent people in second grade and other topics. DK-2nd grade classrooms begin the school year by creating and signing a class charter that focuses on how students want to feel, what needs to happen for those feelings to be consistently present, and guidelines for handling uncomfortable feelings and conflict. This helps set a foundation for creating and sustaining a positive learning environment. Throughout the year students will use other RULER tools such as the Mood Meter, Meta-Moment and Blueprint to further their understanding of their emotions and how to best manage them. In addition, students will explore the RULER Feeling Words Curriculum this year. The goal of the Feeling Words Curriculum is to integrate increasingly nuanced and sophisticated emotional vocabulary into existing academic curriculum. Activities will include analysis of academic materials and current events, self-reflection, discussions, activities, and family interactions. This is an important part of our integrated approach to curriculum, as well as our commitment to continuing to foster, nurture, and grow our emotional intelligence. We partner with our parents, continually sharing RULER resources and workshops, to help parents practice the skills of emotional intelligence at home and learn about how it’s being implemented in the classroom. We’re proud to be a school community who understands that “emotions matter” and that how children feel has profound implications for learning, success, and wellbeing. Our goal is to equip The Willows children for success today, and for life. Cross-curricular connections and flexibility are key components of a Willows’ education. Intersession is a one-week, inter-disciplinary, multi-age exploration of a single topic. Intersession provides an opportunity to explore a new thematic idea throughout the Lower School. The theme is applied to the central academic subjects. This year’s intersession topic is our school-wide theme, Story, which will provide a rich basis for studies. Additionally, we believe that students play an important role in communicating information about their learning and growth. To this end, students lead yearly Exhibitions, where they have an opportunity to share projects with the school community, with an emphasis on process and making learning visible to others.